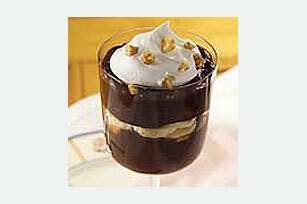 Sugar free chocolate pudding is layered with bananas, then garnished with COOL WHIP and walnuts for an oh-so-easy dessert. Beat milk and pudding mix with whisk 2 min. ; spoon 1/2 evenly into 4 dessert dishes. Top with bananas and remaining pudding. Refrigerate 15 min. Top with COOL WHIP and nuts. Once thawed, store COOL WHIP LITE Whipped Topping in refrigerator for up to 2 weeks or re-freeze.